Lectins are proteins common in seeds. They bind to sugars attached in chains to proteins, i.e. glycoproteins, and are displayed on the surfaces of cells that line the gut. Lectins could inhibit digestion of raw beans, but cooking makes them digestible. Fear of lectins is puzzling. Lectins are proteins that have binding sites on their surfaces for specific single or small sequences of sugars. They are present in seeds to protect the seeds from herbivores. A seed is mostly food (starch, protein, fat) for the plant embryo that will grow from it. This is also true of a chicken egg and just like the egg, the seed contains defensive proteins to inhibit the growth of bacteria, fungi and egg/seed eaters. The egg has enzymes to degrade bacterial walls and proteins that bind iron, vitamins, etc. needed by bacteria and humans. Eating many raw eggs can lead to vitamin deficiencies. Boiling the eggs, unravels the defensive proteins and makes them digestible and nutritious. Seeds block being digested by containing proteins that foul the digestion system of would be devourers. 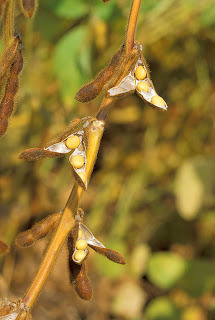 For example, soybeans have trypsin inhibitor that binds to our digestive enzyme and makes eating raw soybeans nonproductive and uncomfortable. Boiling soybean meal to produce a curd, i.e. tofu, agglutinates the denatured soy proteins, including the lectins and washes away the soy trypsin inhibitor. Tofu is free of digestion inhibitors and lectin activity. structure is present on all RBCs. Lectins are specific for A or B or other common bacterial sugar antigens. 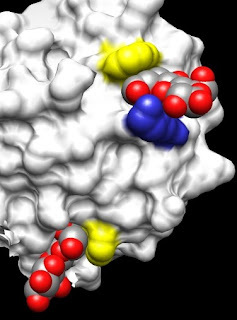 I did some modeling to show a lectin with lactose (red and gray) bound to sticky tryptophans (yellow) in two places on the surface. In one case a lysine (blue) is draped on the other side. That shows that sugars bind both to aromatic amino acids and to the hydrophobic arms of basic amino acids. Some people think that humans and other mammals must be protected from lectins and that this protection is shown in human and cow’s milk in the form of antibodies against lectins. This seems to be a misunderstanding. For example, human antibodies secreted in breast milk are secretory IgAs. These antibodies are glycoproteins, i.e. they are proteins with attached sugar chains. Some lectins will bind to these antibodies, because of the attached sugars. 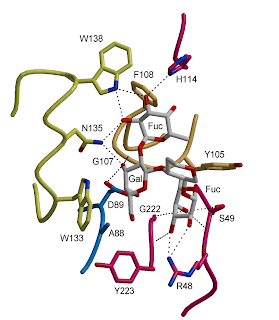 These are not lectin-specific antibodies, but rather glyco-specific lectins. The lectins are binding to the glycoprotein antibodies, not the other way around. 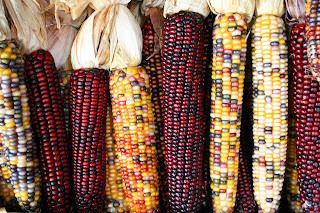 It is possible for people to be allergic to lectins, but this is unlikely. For example, peanut allergies involve proteins other than the peanut lectins. The bottom line is that seed lectins add to the nutrition of cooked beans and grains that have been the foundations for several thriving civilizations. The longest living members of the bean and grain cultures are typically older and more fit than comparable individuals with a modern, inflammatory diet based on omega-6 oils. Another fantastic blog entry to what has now become my personal reference on health. You briefly touched on the mechanism in eggs. I like to knock back some pasteurised liquid egg white in a smoothie often. I understand that the avidin can bind to the B-vtiamin biotin rendering it useless and hence potentially creating a deficiency? Though my supplier informs me that avidin is denatured by the pasteurisation process. Are there any other Lectin-esq molecules that would inhibit my body of its regular functions in egg white? www.nutritiondata.com has egg whites at 28 on their inflammatory scale i.e. mildly anti-inflammatory so that can’t be too bad can it? Also great argument for beans and grains. I’ll cool my inflammation on them a tad and I totally hear you on the Omega 6 oils. But (yes there is a but) I’ve decided to take most of my daily carbs from fruit over grains. Am i being silly here with fructose? I hammer on fructose, a la high fructose corn syrup, because that stuff is particularly nasty. I will write about the test for protein cross-linking in cattle. It has to do with a meat probe to measure fluorescence. Fructose is very sweet, that is why it is in fruit. I don't worry about fruit. Enjoy. I also wouldn't worry about egg white unless you put three eggs in each beer and make a night of it. Even then drinking a very yeast beer would save you. I don't trust their inflammatory scale relative to fatty acids. I was talking to an anthropologist. She said that the life span of someone not killed by accident or infectious disease hasn't changed in the last couple of millenia. Pervasive chronic inflammation may shorten that in some cultures. That is sobering. Perhaps we should add some binding sugar (NAG) before heating and eating them Lectins. Wouldn't you be concerned with their ability to alter the nuclear pore topology and prevent - perhaps permanently - the transporting of proteins through the nuclear membrane? I don't see how the lectins will get into cells and if they did, their only point of entry would be into endocytotic vesicles in which they would be degraded. Lectins from the diet can't get into cells and I don't know why they would have a special affinity for nuclear envelopes/pores? If I missed something, please give me some more info. I'm not entirely convinced human preparation of wheat products, beans or peanuts can sufficiently denature lectins and some are especially nasty. Studies show lectins from different sources have varying degrees of heat stability. Old beans also take much longer to cook then new beans. 1. If the pore it occupies belongs to a post-mitotic cell (brain or heart) we can expect trouble since NPCs don't get degraded and replaced with new one when they get old and accummulate damage. Lectin may be a contributor to the pores becoming leaky with age. 2. The occasional plant or wheat eater (like myself or low-carb/anti-inflammation dieters), without sufficient sugar molecules to bind lectin, could be more vulnerable to the detritus collecting within the cells. 3. Junks (although harmles), in quantity, can still make the cell a breeding ground for pathogens spreading inflammation. Without any outward symptoms to food allergy, my prophylactic measure to the occasional enjoyment of a piece of crusty French bread (my biggest weakness), layered thick with butter, is the concurrent ingestion of a N-acetyl-glucosamine (NAG) capsule. I thought the NAG may help to keep the neurons firing well into the old age. "While a subset of NPC components, like Nup153 and Nup50, are continuously exchanged, scaffold nucleoporins, like the Nup107/160 complex, are extremely long-lived and remain incorporated in the nuclear membrane during the entire cellular life span. Besides the lack of nucleoporin expression and NPC turnover, we discovered an age-related deterioration of NPCs, leading to an increase in nuclear permeability and the leaking of cytoplasmic proteins into the nucleus." "Con A can bind to the mannose moiety of cell surface glycoproteins specifically because the methyl-αD-mannopyranoside can block this interaction. This binding will induce growth inhibition and cell death in a dose- and time-dependent manner." I can't see any reason to think about lectins in terms of nuclear pores. Your references don't have anything to do with the toxicity of eaten lectins and eating a hapten, such as glucosamine, will only stabilize the lectin against denaturation. Lectins come on and off their substrate, so a weak binder, like glucosamine, should have no impact. The impact of lectins and other plant products on our gut flora may be very important, i.e. the opposite of probiotics, would stimulate inflammatory bacteria. For example, baby formula is inflammatory, because it stimulates adult bacteria. Glucosamine may be an effective probiotic and that could be why it takes a while to become anti-inflammatory. I don't think that there is any evidence that dietary lectins leave the gut. If the gut is made leaky by inflammation, that is another story. But even then, lectin would just stick to the extracellular matrix and would eventually be endocytosed and hydrolyzed. They would never enter the cytoplasm and if they did, there would be no target glycosylated proteins in the cytoplasm for binding. All lectins do is bind to sugars. Some toxins virus/bacterial hemagglutinins have sugar binding capacity or and are then termed "lectins", but that is another story. I guess you could hypothesize that all lectins are actually toxins and like ricin have sugar binding and destructive subunits, but that hasn't been observed. Please point to the web sites that provide documentation for any negative impact of cooked lectins. I am as unconvinced of damaging lectins as I am of the damage of phytate, but I can be easily persuaded by data. Thanks for reading my blogs and commenting. Wheat germ agglutinin (WGA) is a plant protein that binds specifically to sugars expressed, among many others, by human gastrointestinal epithelial and immune cells. WGA is a toxic compound and an anti-nutritional factor, but recent works have shown that it may have potential as an anti-tumor drug and as a carrier for oral drugs. To quantitate the toxicity threshold for WGA on normal epithelial cells we previously investigated the effects of the lectin on differentiated Caco2 cells, and showed that in the micromolar range of concentrations WGA could alter the integrity of the epithelium layer and increase its permeability to both mannitol and dextran. WGA was shown to be uptaken by Caco2 cells and only ≈ 0.1% molecules were observed to cross the epithelium layer by transcytosis. Here we show that at nanomolar concentrations WGA is unexpectedly bioactive on immune cells. The supernatants of WGA-stimulated peripheral blood mononuclear cells (PBMC) can alter the integrity of the epithelium layer when administered to the basolateral side of differentiated Caco2 cells and the effects can be partially inhibited by monoclonal antibodies against IL1, IL6 and IL8. At nanomolar concentrations WGA stimulates the synthesis of pro-inflammatory cytokines and thus the biological activity of WGA should be reconsidered by taking into account the effects of WGA on the immune system at the gastrointestinal interface. These results shed new light onto the molecular mechanisms underlying the onset of gastrointestinal disorders observed in vivo upon dietary intake of wheat-based foods. What If Medicine Was Scientific? Antioxidants or Fermenting Gut Flora?